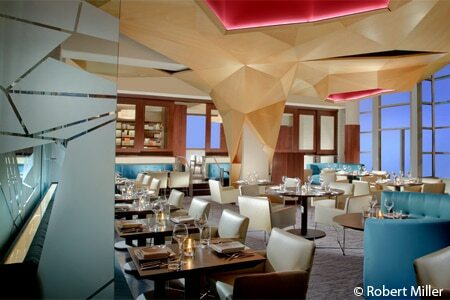 Daring contemporary Indian dishes in an ultramodern setting. : Restaurateur Ashok Bajaj elevates the level of fine dining in DC --- and affordable dining at that --- with Rasika West End. The original destination in Penn Quarter, with its headliner chef Vikram Sunderam, has the air of a slightly comfortable neighborhood eatery, while this outpost has a completely different presentation with a touch of modern zing: crafty overhead lighting yielding an air of dark mystery; room divisions that provide a sense of privacy; and a menu that is not a copycat of its sibling’s. Although Sunderam oversees menu development, the resident chef puts his own stamp on such dishes as chicken tikka masala, dum ka lobster and fiery lamb michi korma. You will find the usual suspects among the breads, but hold on --- what about chili olive naan or onion and sage naan? For dessert, try a date-and-toffee pudding. Check out the wine list; you will pass extensive glass wine cellars on your way to the table.